I eat spinach all the time. Your dressing sounds really good. That just might be on our menu tonight too. That sounds delicious - too bad I already had everything in for our son's birthday barbecue. This looks like next weekend's feature! 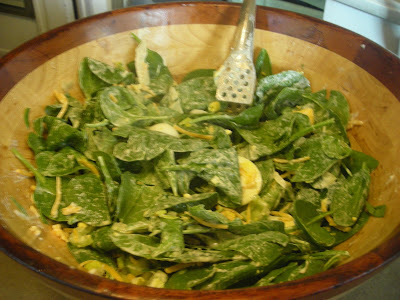 Great spinach salad. Love the remembering where your Mom shopped. I ate at Putsch's 210 and loved it. I also ate at Putsch's cafeteria on the Plaza where they had fabulous cinnamon rolls and a different version of Putsch's spinach salad,which I liked better than the 210 version. I am bringing a bit of KC to Arizona this Memorial weekend by fixing the salad and my favorite KC brisket recipe. Here is the recipe for the salad. 2-10 oz packages frozen spinach- Thawed and drained. Blend and mix all ingredients but the spinach. Add spinach and chill 24 hours. I remember Putsch's. I actually worked at Harzfelds for a few years. Thanks for the recipe. I'm making it for Easter dinner. My Grandmother married Jud Putsch after both were widowed. Hey was a great guy. Thanks for the recipe. 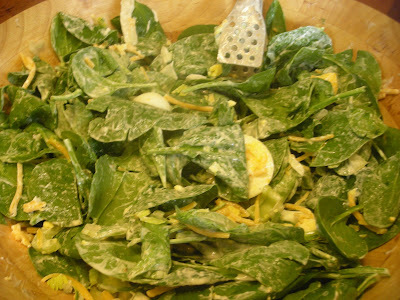 I too enjoy the spinach salad that my mom loved. However if I remember correctly, the recipe I have is from Putch's cafeteria. The second version on the comments is what I have with the exception of cubed cheddar. My recipe called for Kraft Old English Cheese shredded. Unfortunately the unique cheese in the blue box is no longer sold, except in tiny glass jars with a crazy price point. I now use Velveeta. We also always served the horseradish on the side (that may have been my mom's idea as she was not as fond of horseradish) and grated an extra hard boiled egg on top of the finished product. Just made it today as my husband loves it and deli spinach salads are not even close to the great flavor of this combination of goodness. Another great recipe would be the hamburger relish from Wolferman's Tea room. Anyone remember that one? I remember ordering a spinach salad from Putschs cafeteria each time my Grandmother and I would take the Greyhound bus to Kansas City to shop. I remember the salad being compact and rounded. I clipped the original recipe from the Kansas City Star many years ago. I'll locate it and post. Posted in the KC Star years ago. The salad I ordered was very compact, and rounded, like it was dipped from an ice cream dipper. 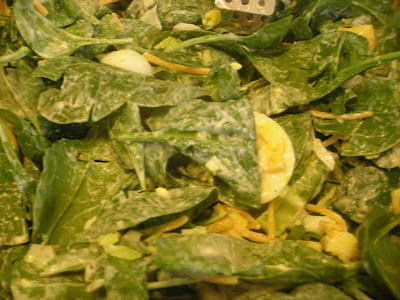 I loved this salad when I was a child.